When a job seeker applies for a job through your career portal they are taken through a step-by-step application process. 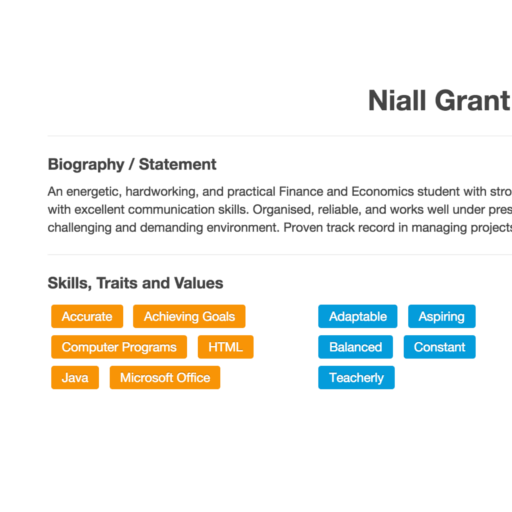 This ensures you receive well-formatted, informative applications, with all the relevant information exactly where it should be. 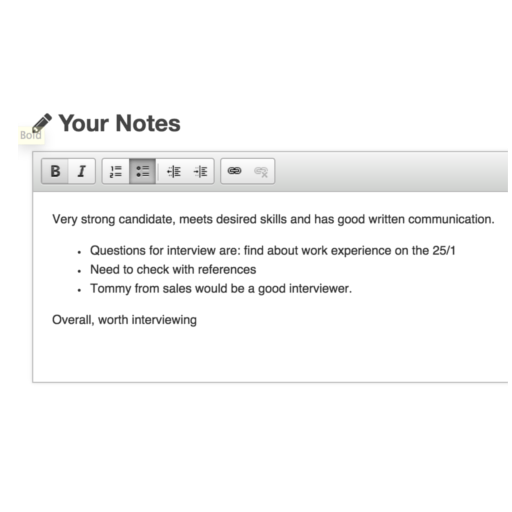 Quickly and easily store your thoughts on each applicant with our note taker. Use lists, bullet points and basic formatting to help clarify your notes. Discuss an application with the appropriate team using comments. Review an application, place it into a "Pile"
Once you have reviewed a job application you simply put it into the: "Offer", "Interview", "Decided Later" or "Decline" Pile, just like you would with paper copies. You can then schedule events such as interviews or even onboard new staff from the appropriate Pile. Easy. Communicate to all applicants in a pile with just a couple of clicks. 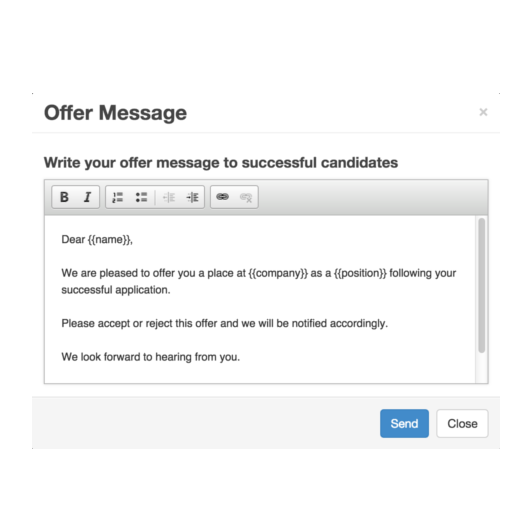 Your messages will be personalised to that individual applicant. This means you can schedule interviews, send decline and offer notices in a fraction of the time it would normally take. 14 days free. No credit card required. Workbase is online Human Resource software designed for small and medium sized businesses. Workbase is perfect HR software for HR professionals, small business owners, and entrepreneurs who want to grow their business effectively. Each month we gather our thoughts and share the best stuff with you.